Students use movement to visualize periodic properties. 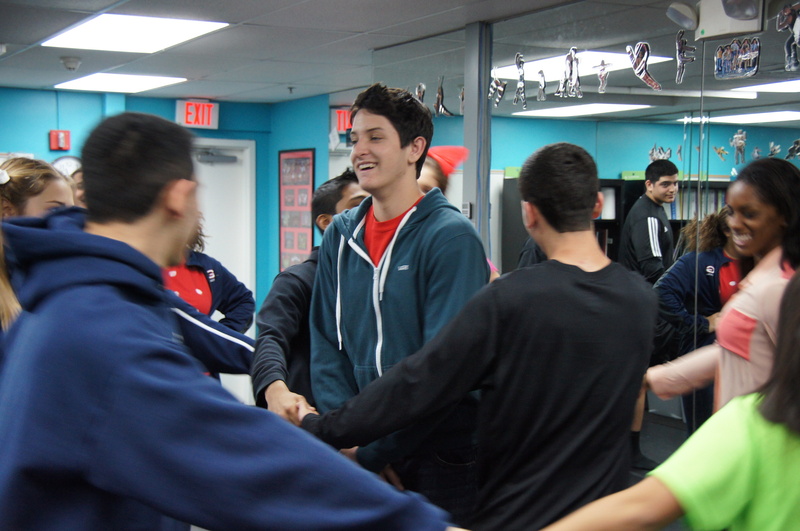 Students in Dr. Wojcik’s honors chemistry class were surprised when the class met in the dance studio. What could dance have to do with chemistry? According to Director of Dance Academy, Ms. Katie Petronio, dance and movement is a vital link in the education of the whole student. Movement in the classroom has many benefits: it encourages cooperative learning, develops capacity for problem solving, and enhances learning and retention. Ms. Petronio gave a presentation about using dance to teach academics during a professional development day earlier in January. It was during this presentation that an idea was formed– to teach periodic properties through dance. For a complex subject such as chemistry, an activity incorporating movement with academic content reaches students who are spacial and kinesthetic learners and helps to reinforce concepts for all types of learners. Students plan out their next formation. Students use movements as an interpretation of the element Neon. 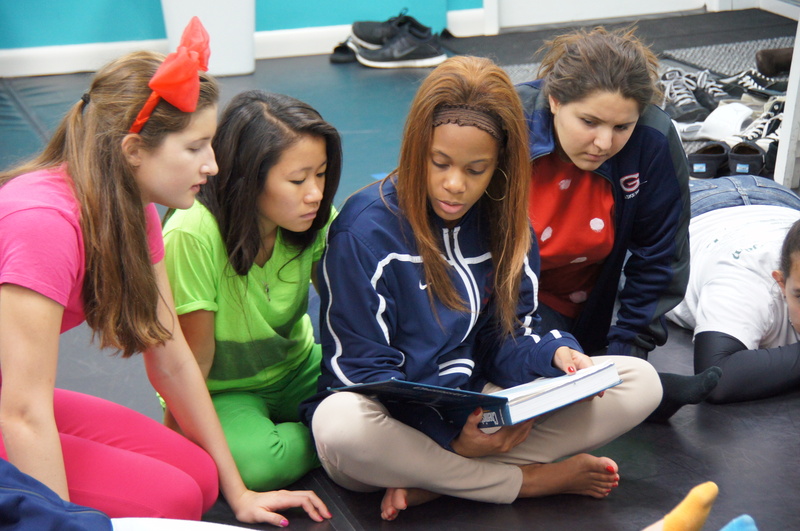 “Providing the definition and application through dance has made this lesson a great success,” affirmed Dr. Wojcik. 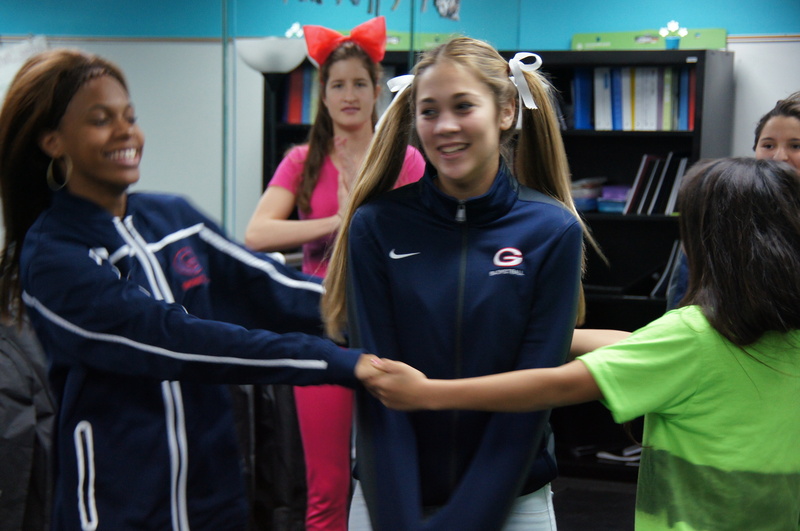 The students enjoyed the activity so much that they even integrated more complex concepts, reactivity and compound formation, into their dances. * For those that need to brush up on their high school chemistry: Atomic size of an atom is determined by the distance of the outermost electrons from the nucleus. The ionization energy is the energy needed to remove one electron from an atom. In the atom, (-) charged electrons are attracted to the (+) charge of the protons (which are subatomic particles in the nucleus); the attraction force between the nucleus and the electrons determines the ionization energy, atomic size, and metallic characters. Metallic characters are seen in atoms that are able to loose the valence electrons easily and are mostly prevalent in metals on the left of the periodic table, decreasing from left to right going across a period. Still confused? Maybe you should visit Dr. Wojcik’s chemistry class! WHY ARE STUDENTS IN CRAZY OUTFITS DURING THIS ACTIVITY? It’s homecoming week, of course. You should have seen all of the crazy outfits, but that is for another post! Tags: chemistry, dance, Education, kinesthetic learners, movement. Bookmark the permalink.